Definition at line 214 of file soapStub.h. Definition at line 217 of file soapStub.h. 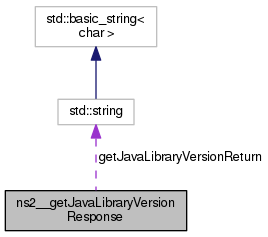 Referenced by MiriamWebServicesSoapBindingProxy::getJavaLibraryVersion(), soap_default_ns2__getJavaLibraryVersionResponse(), soap_in_ns2__getJavaLibraryVersionResponse(), soap_out_ns2__getJavaLibraryVersionResponse(), and soap_serialize_ns2__getJavaLibraryVersionResponse().